Hey guys! I’m back today with another writing-related post. If you’re interested in getting published yourself, make sure to check out my previous posts at the bottom of this page! Being published in The Huffington Post is a great accomplishment by any means, but if you also have a blog or social media channel, it’s important to write your posts in a way that ties the two together and makes it easier for those readers to find you. You want to make sure to convert the traffic you get from the Huffington Post, otherwise you are losing potential readers. In today’s times, most people skim articles and don’t put a lot of effort into taking extra steps to find out who you are (unless you really catch their attention). By following some simple, easy steps, you’re essentially doing the job for them as they read and you can successfully grow your blog with new readers. Most likely you are publishing content on HP that is similar to content you already publish on your blog. Because of this fact, think back to any old content you have and include backlinks to posts that are related to your topic. Find a way to work old material into new posts or simply pique the reader’s interest as I did here. I made this mistake when I was originally accepted to write for The Huffington Post. I went a little overboard and started copying and pasting some of my favorite blog posts straight into the editor. According to HP, this is totally acceptable and they don’t mind publishing unoriginal content. Who DOES mind, however, is Google. Having the same post published in two different places can lead to penalties by the internet giant. These can range from decreases in search page rank to shutting down your site. It may never happen, but it’s a good idea not to tempt fate. I’m sure all of you are fantastic writers who can come up with something original to publish. Along with your author picture you are able to include a short bio that sits at the top of your post. Make sure to use descriptions that sound interesting and entice people to want to learn more. Similar to your social media profiles, your bio should be concise and include any and all pertinent information. I start all of mine with the fact that I am a recovering addict, something you don’t typically see and tends to arouse curiosity. I also make sure to include the URL of my site so that people know where to go in case they are interested in finding out more. You author bio should include the name of your blog and URL if possible, but the problem with this is that it is not clickable. Readers would have to be especially interested in finding out more about you to search for your blog separately from reading your post. The Huffington Post allows you to add your Twitter account to your bio which will automatically be included at the bottom of each post. Make sure this field is filled in to allow readers to follow you on another platform. 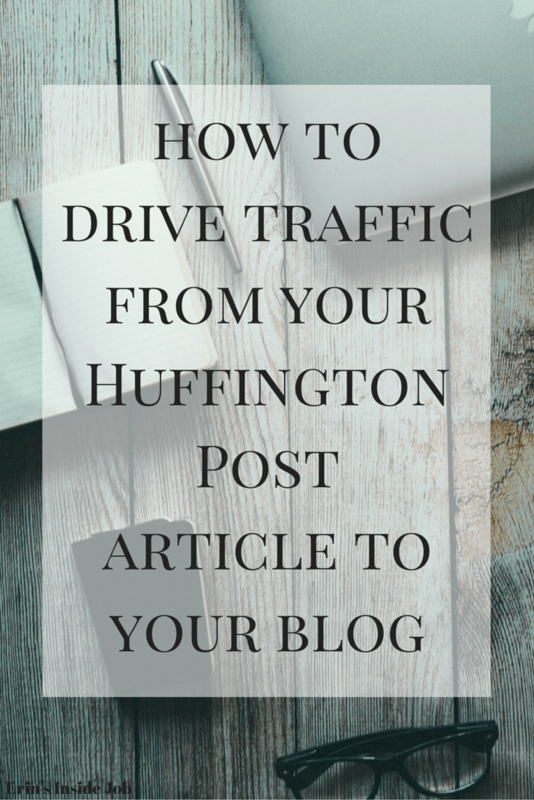 Follow these five tips to drive traffic from your Huffington Post article to your blog! Do you go out of your way to connect with people you find interesting? Oh yes! These are good tips for writing for any site really. I need to read your other posts on HP. I am a skimmer and a reader. You know me, I’m too ADHD. But when I read something, I READ it. And I go back and make sure that I read it correctly! Me too. I had a friend in elementary school who got so mad that I read fast and she never believed me! 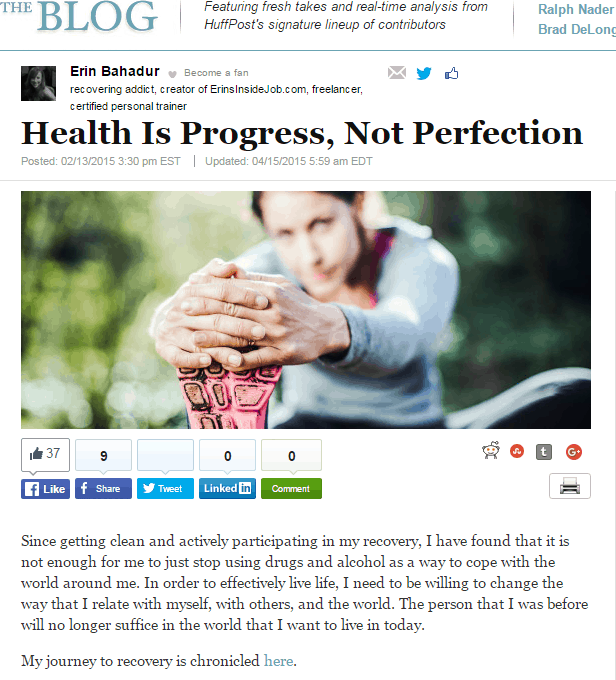 Looking back, even though I’d stumbled across your blog a time or two before (probably a linkup), I think it was one of your HP articles and your inclusion of “recovering addict” in your bio that led me to read some of your archived posts, which ultimately led me to continue following because I enjoy your writing and honesty. Now, if I could ever come up with something worth sharing I’ll keep these tips in mind. It’s one of my goals to have an article published (anywhere) this year. Yessss it worked! 🙂 I’m sure you have plenty to share! I like to look on there and see what post topics are popular and if I can offer a twist or original idea. Make sure to jot down ideas as you think of them! This is a really great read! I’ve been publishing to HuffPo for about a month now and I haven’t seen a TON of traffic from it, but I also wasn’t following these awesome tips. I will definitely be applying there for my next submission. PS. How do you get the title of your post over the image (up at the top of this post)? I’ve actually be referencing your other posts about the HuffPost recently because it’s one of my 2016 goals to get published on the Huffington Post. Thank you for these tips! I was considering republishing some of my better blog posts, but what you say about Google and SEO makes perfect sense, so maybe I’ll work on repurposing those posts instead, since there’s so much to say for any given post that doesn’t make it onto my blog as it is. Thank you for this post! I’m a speed reader: I try to read the whole thing, but I tend to read fast (I blame having to read about 300-500 pages a day when in grad school!). If I really liked a piece, I read it again at a slower pace. Awesome Laura! You can definitely write on the same topic, I would just change things around a bit or write to a different audience so that it’s not exactly the same. Never have I tried writing for HP… But hey, if you wanna write a post and link to my blog, you have my permission! LMFAO! 😉 BAH HA!!! Hahaha I’ll keep that in mind! Thanks for a great article that came for me at the perfect time! I was just thinking how I could increase traffic to my personal blog. I am fortunate to be a Huffington Post blogger and will try out your suggestions. Terrific advice! Good luck to you as well! That’s great! You already have one obstacle down. Good luck and I hope you see an increase in traffic! Submitting to HuffPost is way down on my list of priorities (not on purpose, just don’t feel like I’m “THERE” yet), but this is a great resources for writers!! Thanks so much Andrea! I’m so glad it’s helped! Oh good I’m so glad you found them helpful! There’s actually another one I wrote recently about the changes they made to their platform. If you search for “Athena” it should come up!